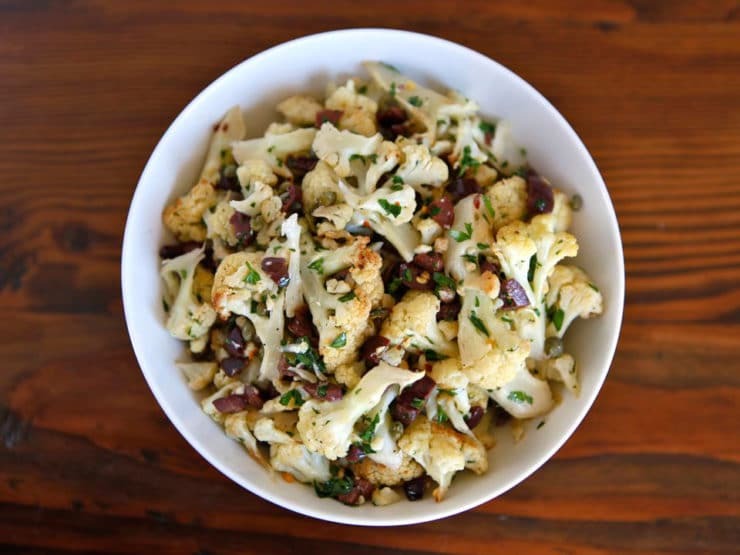 Italian Roasted Cauliflower Salad from Calabria, Italy – Tasty, Vegan, Gluten Free. 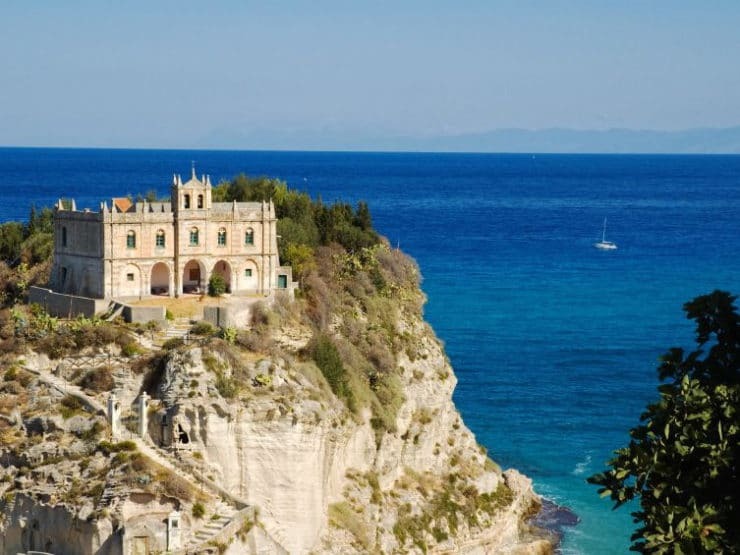 As we head into the weekend, I thought we’d explore Southern Italy a bit more as part of my Culinary Staycation series. Last week, we dined on a simple Tuna Salad Caprese on the gorgeous island of Capri. 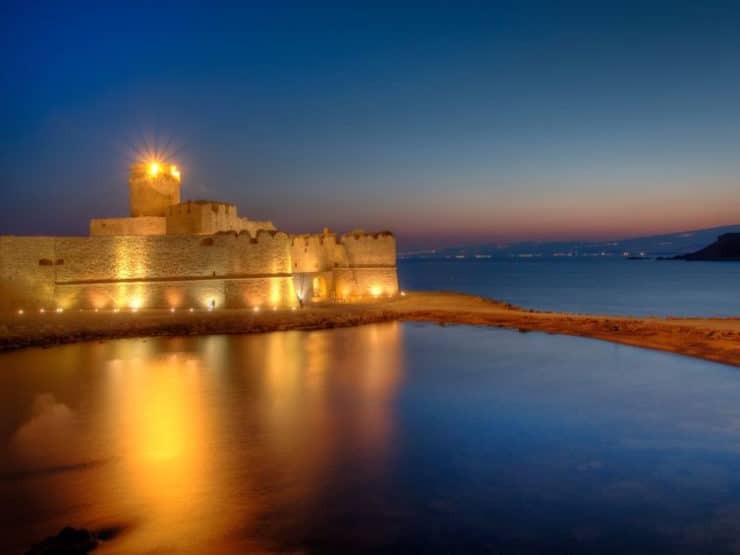 Today, we’ll travel south to the tippy-toe of the Italian boot, to the region known as Calabria. Calabria’s geography, with direct access to the Ionian and Tyrrhenian Seas, made it desirable to a number of conquering nations throughout history. During the 8th century B.C. the Greeks ruled, followed 500 years later by the Romans… then the Teutons, the Goths, the Lombards, the French, the Sicilians, the Spaniards… the list goes on. Each conquering nation made an impression on the local cuisine, giving Calabria a tapestry of amazing flavors to play with. Some of the most important ingredients in Calabrian cuisine were introduced by the Arabs– eggplant, citrus, artichokes, and raisins are all major players in Calabrian cooking. The Spaniards and French brought their own influences. With all of these colorful countries in the mix, it’s no wonder that Calabrian food has so much flavor… it’s anything but tame. Strong flavors like chili peppers, salty brined capers, and lemon juice abound. I adapted this salad from a wonderful cookbook (now out of print) called “The Food of Southern Italy” by Carlo Middione. This book is a treasure trove of authentic Italian cooking. In this traditional Calabrian salad, cooked cauliflower is drizzled with olive oil and tossed with olives, capers, parsley and chili flakes. I took many liberties with the dish; to start, I roasted the cauliflower rather than boiling it to release the natural sugars and give it some caramelized flavor. I cut the olive oil a bit to make the salad lighter, and added lemon juice to brighten the flavor for summer. The original recipe calls for anchovies, but I didn’t have any on hand so I left them out, choosing to double the amount of olives instead (you can add 8 chopped filets if you like, but cut the amount of olives in half so you’re not overwhelmed with salty flavor). The salad includes a lot of salty ingredients, so I’ve made the salt optional… taste and adjust seasonings as desired. This salad is super healthy and flavorful. It’s vegan, gluten free, and works for both Mediterranean and low carb diets. Enjoy! 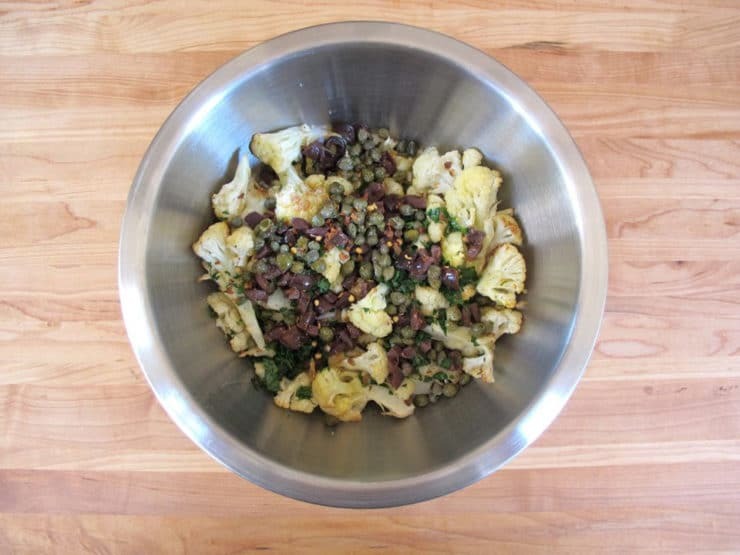 Roasted cauliflower salad from Calabria, Italy with olives, capers, chili pepper, parsley and olive oil. Healthy, gluten free, vegan, pareve. Place a rack in the center of your oven and preheat to 425 degrees F. Line a baking sheet with aluminum foil for easier cleanup, if desired. 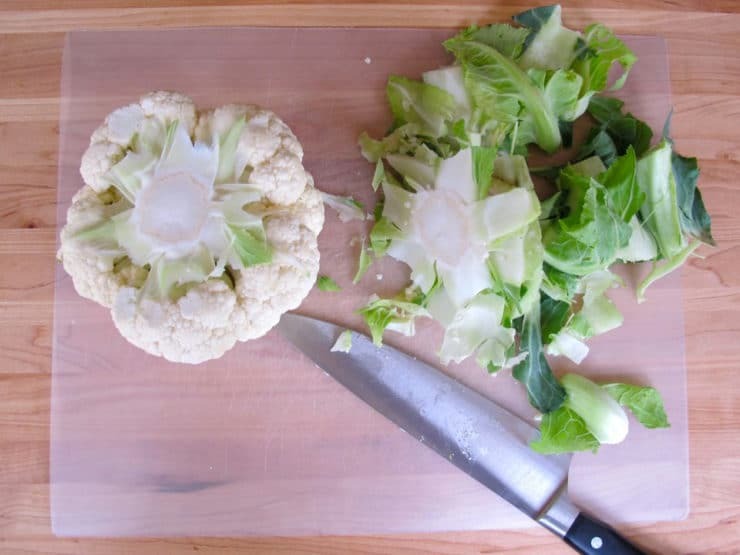 Pull the leaves off of the cauliflower base. Cut off the lower part of the stem. 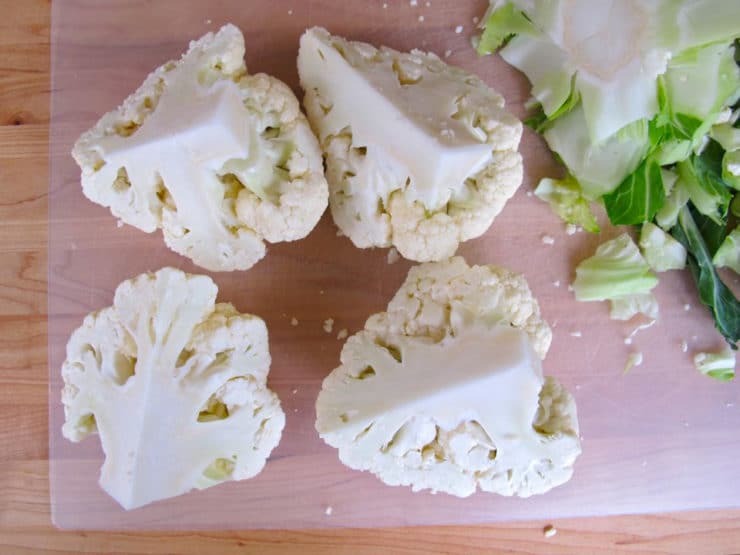 Cut the head of cauliflower into four quarters. Slice each quarter into 6-8 pieces. You want as many flat surfaces as possible on each floret-- the flat surfaces caramelize best. Caramelization is the key to giving the roasted cauliflower flavor-- those golden, sugary juices take this veggie from good to amazing. 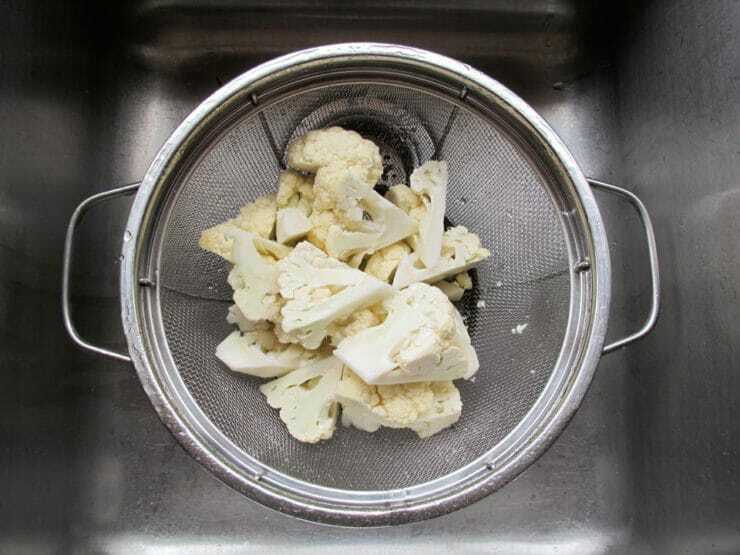 Give all the florets a thorough rinse in a colander. Shake them dry. Place the florets in a large bowl and drizzle them with 1 tbsp olive oil. Add the minced garlic florets to the bowl. 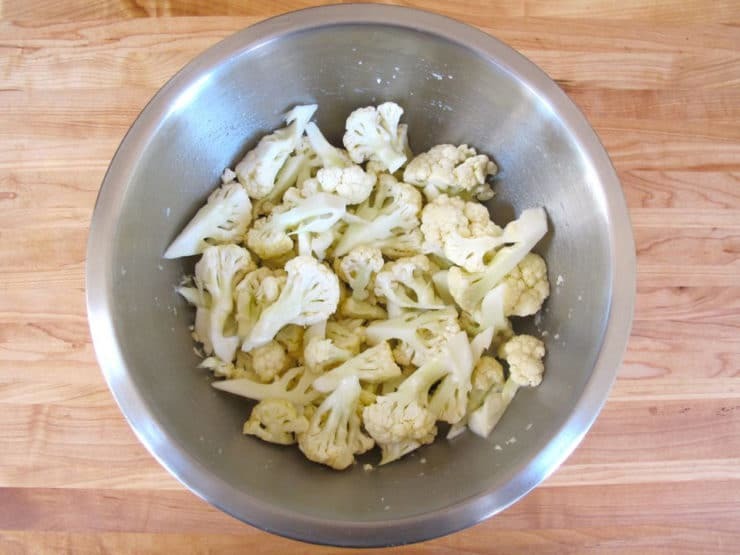 Toss the cauliflower florets till they're coated with olive oil and minced garlic. Spread the florets out in an even layer on the baking sheet. Reserve any small bits of cauliflower that have fallen away from the florets in a small bowl. 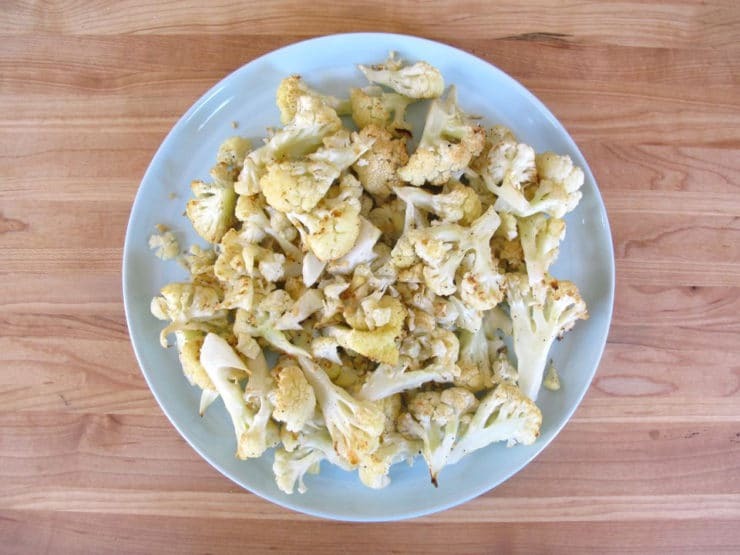 Sprinkle the cauliflower florets lightly with pepper. Place the baking sheet into the preheated oven and let the cauliflower roast for 10 minutes. 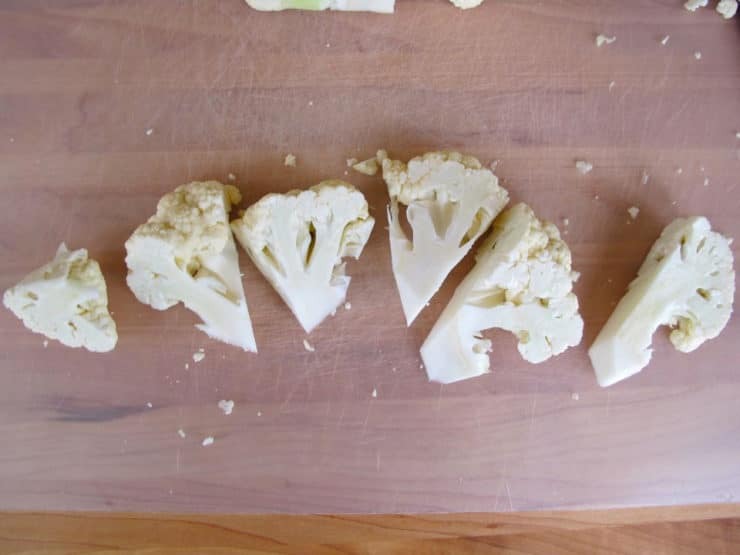 While cauliflower is roasting, prep your other ingredients-- chop the parsley, juice the lemon, etc. After 10 minutes, remove the baking sheet from the oven. Use tongs to turn over the florets, making sure that the florets with flat surfaces are pressed directly against the baking sheet. This will enhance caramelization. 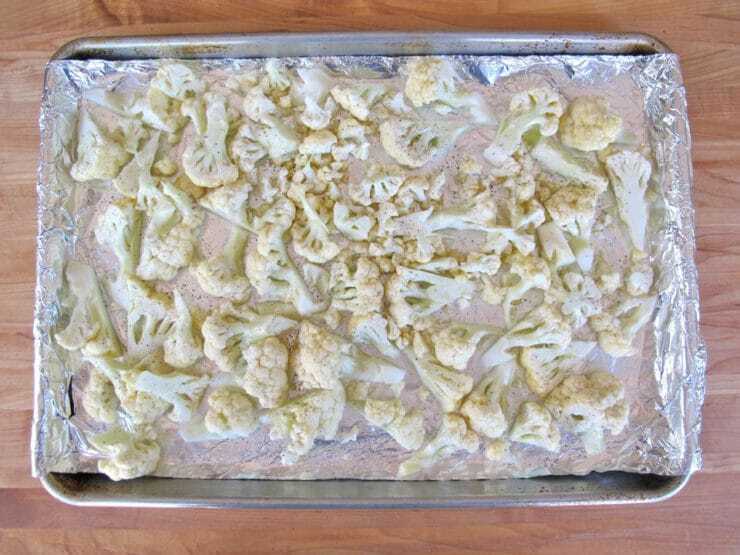 Sprinkle the reserved cauliflower bits onto the baking sheet. Return the baking sheet to the oven. Let the cauliflower roast for 10-20 minutes longer till tender. When it's ready you will be able to pierce it easily with a fork. Remove the cauliflower from the oven. Spread it out on a large plate or platter and allow to cool. 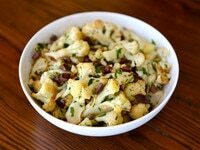 Throw the room temperature cauliflower into a salad bowl along with the remaining 3 tbsp of olive oil, parsley, chopped olives, capers, lemon juice and red pepper flakes. The red pepper flakes are very spicy, add with care. Toss gently to combine all ingredients. Season with salt and pepper to taste (I didn't add any salt because the olives and capers are salty, but some might like a touch of salt added to this dish). You can also add more olive oil to taste, if desired. Serve salad at room temperature. Italians like to serve this salad with warm freshly baked bread and copious amounts of olive oil. Served on its own the way I've described here, it is gluten free, low carb, and heart healthy. Passover Note: If you're making this for Passover, note that it is difficult to find capers with a kosher for Passover hechsher. If you're worried about the hechsher, substitute 3 more tbsp of chopped olives for the capers. Fabulous! Make for New Year’s Eve dinner party. Everyone loved it. I added golden raisins. Loved the sweet and salty. Loved this recipe. Even snack on it sometimes. A couple florets here, a couple florets there, and pretty soon no more cauliflower salad. I am currently making it for the third time. May even make it a fourth time for Christmas. ok to make 24 hrs ahead? seems like the flavors may improve but not sure if the cauli will hold up? I have made this multiple times and I LOVE it. Thank you for this awesome recipe. Delicious! So Delicious! Only change was to add lemon zest as well. Golden raisins would be an interesting addition. This is going to become a staple in our house. Happy to find a super-flavorful and easy “wow” side to serve guests. (Tasting note: pairs well with Corona). Thanks for this recipe! ? 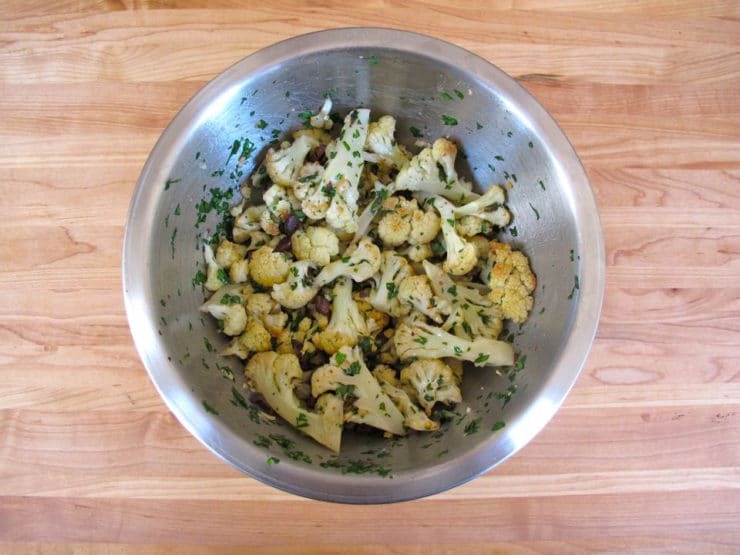 My easiest way to roast cauliflower is to coat the cauliflower in the roasting pan with lots of olive oil. You don’t need to measure the amount, just till it is all coated. I sprinkle some dried thyme and oregano over all …not too much. Next I take about hall cup of panko breadcrumbs and pour olive oil in the cup till the crumbs are moistened. Mix thisin the pan w cauliflower. Thinly slice about 8 cloves of garlic and sprinkle on top. I roast at 450 for about 25/30 min. I’m so happy to say that I found a new favourite salad recipe! The flavours we’re incredibly we balanced, truly delicious! Thank you! I was looking for a lighter cauliflower salad recipe and found this. Delicious. It was hot and I don’t have air conditioning so I pan roasted the cauliflower which worked great. I also thought that the recipe could use a little bit of sweet to offset the briny olives and capers so I roughly chopped about 2 Tbls of raisins and it was perfect. This was great, thank you! I’ve lived in Italy and had something like this once, but never had the recipe. I will mention one of my best cooking ‘tricks’ learned while living in Germany. Pretty much any dish that involves cauliflower (or spaetzle) is made extra delicious by the addition (at the end/as a topping) of browned butter breadcrumbs. That is, make your breadcrumbs, brown some butter, and mix the two with a bit of salt. You want the breadcrumbs soaking up the butter, but not drippy. I tried the breadcrumbs on this and loved it even more! This looks wonderful. I love cauliflower and capers but not olives of any kind. Can you or anyone else commenting here suggest a substitute? I also can’t eat beans or green peppers so they would not work either. I learned how to roast peppers from you and it’s one of my favorites now, I put them in everything. I was just getting ready to roast some and realized I had both an eggplant and cauliflower in the fridge and thought, I wonder if I can roast them too? So here I am because I was sure you would have the answer. Just finished reading about the eggplant and will do that next. I searched “low carb” from your index and that brought me to this recipe. I love your site! Thank you for sharing. I tend to agree with another reviewers that the olives are not imperative (although I find them delicious in the salad); that said, I added some chopped sun-dried tomatoes and believe that would be a good substitute for olives altogether if olives aren’t your thing. The salad was a huge hit and will become a staple, especially in this ketogenic-tending house. Love this salad. Riffed on it a bit for a BBQ party by adding toasted pigoilis, golden raisins, and a light Dijon aioli cut with mayo and a touch of heavy cream, then added thinly sliced lemons and a squeeze of juice as I didn’t have any preserved lemons. Amazing every time! My favorite way to eat cauliflower! Sometimes I’ll toss in a bit of brown rice pasta or quinoa for a very filling main dish. Oops just to add, the capers are a must ,it’s the combination of the salt/ sour/ citrus / herbs that gives the cauli the umami bang . A classic recipe, this really works . Looks delicious. I usually roast cauliflower with rosemary. Coat pan with a liitle oil first. Roast at 400-delicious and always a hit. Thank you for sharing this treat . Will have to make this week. Happy Purim. I love to steam cAuliflower, fork mash it, not too soft, season and serve in place of potatoes. Just that easy to amazing. Loved this recipe! Now I want some!! this sounds so good. I am definitely going to try it. Holy CAULIFLOWER Batgirl!!! This looks AH-MAZING!! Sounds amazing!! I’m making this tomorrow!! I’m thinking about making this for my seder. Can it be made a day in advance or is it best if it doesn’t sit in the fridge? Hi Havi, no problem making this ahead, but take it out of the fridge an hour before the Seder, as it is best served at room temperature. I added some slices of Spanish onions, chopped red capsicum & half a can of drained chick peas. Used fresh chilli instead. Awesome salad!! Yum yum! Great salad, and I’ve passed it on to my dieting friends- they went crazy over it! I added 2 tsps of a balsamic glaze (balsamic reduction) which added another dimension to the dressing. Thanks for another great recipe! Great idea on the balsamic Janice! Your recipe appears super ! Will try it tomorrow. So much effort seems to have gone into the presentaton of it. Well done. Have made this more than once, now … really fabulous, and a big hit even with the non-cauliflower / veggies-aren’t-my-besties crew! Thanks! you neeeed to have your own cooking show! 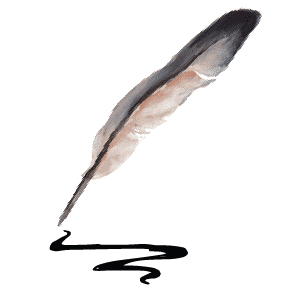 i love your blog so much keeping history and good foods alive , and using fresh ingredients. youre an inspiration! What an incredible explosion of color and delight, I actually need time to study your blog because I plan to inspire myslef, kisses and congrats :). Love roasted cauliflower so this would make me do the happy dance for sure. 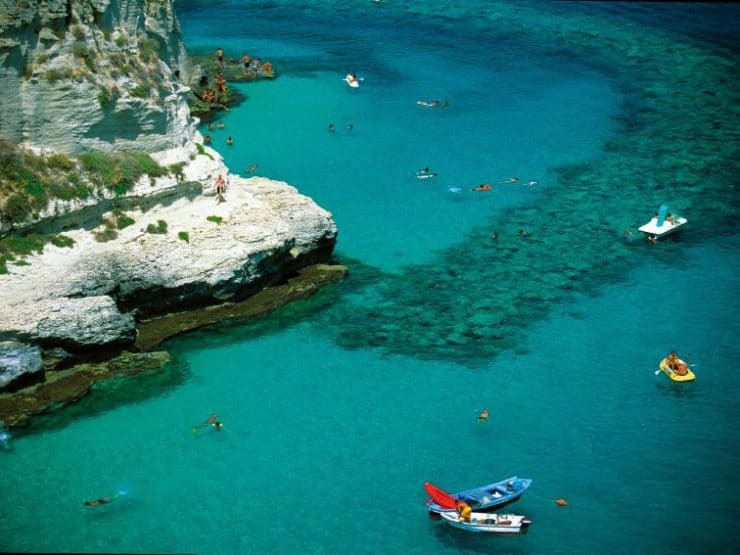 Love all the photos of Calabria. Gorgeous. This salad just rocked my world. I have been looking for a simple cauliflower dish since visiting Sicily last year. I didn’t have any olives so I left them out entirely, but it was fantastic nonetheless! I’ll be adding this mouthwatering salad to my arsenal! Thank you for sharing! Your pictures are beautiful! I love finding new cauliflower dishes, so thanks for sharing! Incredible photo’s of Italy and the food. Sounds delicious Tori. Great idea to roast the cauliflower! This sound absolutely delicious. I would serve it as a salad, or hot out of the oven, even over pasta. YUMMO! This is delicious! I just made it, following the recipe exactly. I think it will be a summer staple. Thanks for the cauliflower cooking tips, too. Happy you enjoyed it Stephanie! This caukiflower dish looks like a journey to heaven and back! Will definitely make this week. looks amazing…i love roasted cauliflower! Hi Tori, I am such a fan of your other Roasted Cauliflower recipe so will try this one…however I am not a fan of the black type olives. I only like the green ones…wondering if they would work instead? Or maybe some Feta? Thanks as always, love your site and you! I enjoy all of the recipes, but this one is going to make me chew my arm off. I am making this over the weekend.